Another year in the books. 2018 is going to be BIG! Cranking out New merch, bringing back the comedy and we'll be dropping some even bigger news in the next few weeks! We are just local artists that are fortunate enough to make a living doing what we love. 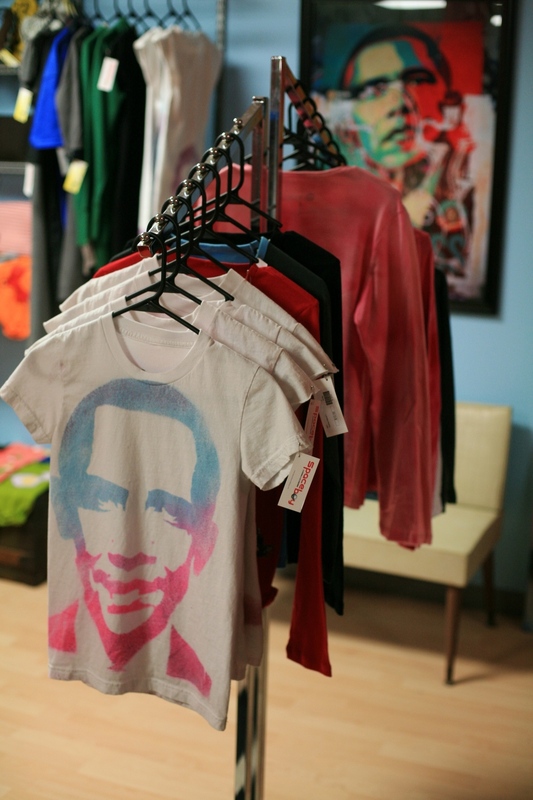 We opened our first shop in February 2009 on Kirkwood Highway. Just kind of jumped in, with really no idea what we were doing. Check out the time warp below! Thank again to everyone for your support. Check out our new graphic t-shirts! Over the past few weeks we've been working on some brand new stuff for you guys. And we've got some cool new designs from Local artists, Gus Fink Studios and Sore Eyes Design as well. We're excited for the New Year and we will be adding more merch in the days to come! A forgotten, sad, littered, dark area with dirty brick walkways, muddy grass patches, people passed out on benches and the smell of piss hit me eventually after the wind calmed down. It was sad to see and kind of bummed me out that thousands of people drive by here everyday and have no idea this place exists. But I also saw the potential of what it could be. It's in a great location, right next to Del-Tech School and right off of Market Street & LOMA. A block or so from the Queen Theatre, bank buildings, bus/train station, restaurants, a coffee shop and parking garage. People should be chilling here! Drinking a coffee, reading a book. There's plenty of seating and lots of wall space for artists. The steps are really cool too, and the back of the sculpture could be dubbed as a small stage that faces the park and sidewalk. I told Will I wanted to rename the park. "HUMBLE PARK" To express equality in the community and it sounded good too. Not really sure if he thought I was serious or not, but he said "cool". So, yeah! I've planned 2 summer events, you can learn more about them here. And I will be posting more after HUMBLE PARK'S MAKE OVER on the 12th. Come join us! UPDATE 8/14/17 ---------- The Clean up was a SUCCESS! I was so surprised by the turn out, team work and positivity of this event. It was amazing to say the least and got to meet some great new people. Workers from the city and volunteers from the community joined forces to make this happen & we even got some press out of it! (See below)! We are now working with the City of Wilmington & New Castle County to officially rename the park. Soon HUMBLE PARK will be official. There is much more to come! It has been crazy over the past few weeks! The comedy show was a hit and KEEP IT COOL was everything we had hoped for. Leading up to the events, I ran into a bit of trouble with the city regarding the HUMBLE PARK decal on the sculpture. The city took it down the very next day after the Comedy Series and I was pretty disappointed since we had another event the following Friday. Luckily I had a friend who had been in contact with the Sculptor a couple years prior and she gave me his contact info. On a whim, I sent out an e-mail explaining the situation asking for permission add a HUMBLE PARK decal to his artwork. The next morning I was delighted to find an e-mail from Ric Snead, the artist and architect who holds the key to HUMBLE PARK. He was delighted to hear from me and our efforts and gave us permission to add signage to "PROA" Portuguese for "Sail Boat". We will have more information about Mr, Snead soon. So the events were a HIT and I can't wait to see what other cool stuff people come up with. Thank you all for your support and great job! Go to the Humble Park Facebook page for more! We are very excited to be on the "BEST OF DELAWARE" list this year for Custom T-Shirts / Editor's Pick. The funny thing is, we had no idea we were even nominated. We found out in a "Congratulations" e-mail from Delaware Today but none the less are very honored to be chosen. We will be kicking it at the Chase Center August 10th for the B.O.D. Party so be sure to stop by our booth. We'll be giving away Free T-Shirts & High Fives all night! TRYING TO START YOUR OWN T-SHIRT BRAND? We get TONS of phone calls & e-mails from people that want to start their own clothing line or that hot new T-Shirt brand. Yes, we print clothing. But there is so much more you should learn and read up on before even contacting a screen printer. Now you might be thinking, "This guy is an idiot, why does he care? Just take my money and give me what I want." Yes, I'm down with that and we appreciate you, but if you truly are serious about your project, get familiar with what you're getting yourself into and all of the steps that go along with it. Do it Right! Check out this book, you can buy a digital or hard copy for less than $20. I have read it myself and it's great! Made these awesome DIY custom Pillows for an upcoming art/craft show. I haven't done anything like this in a while and it was lots of fun. Starting from a simple drawing then onto cutting, printing, sewing and even made custom tags as well. Check it out! 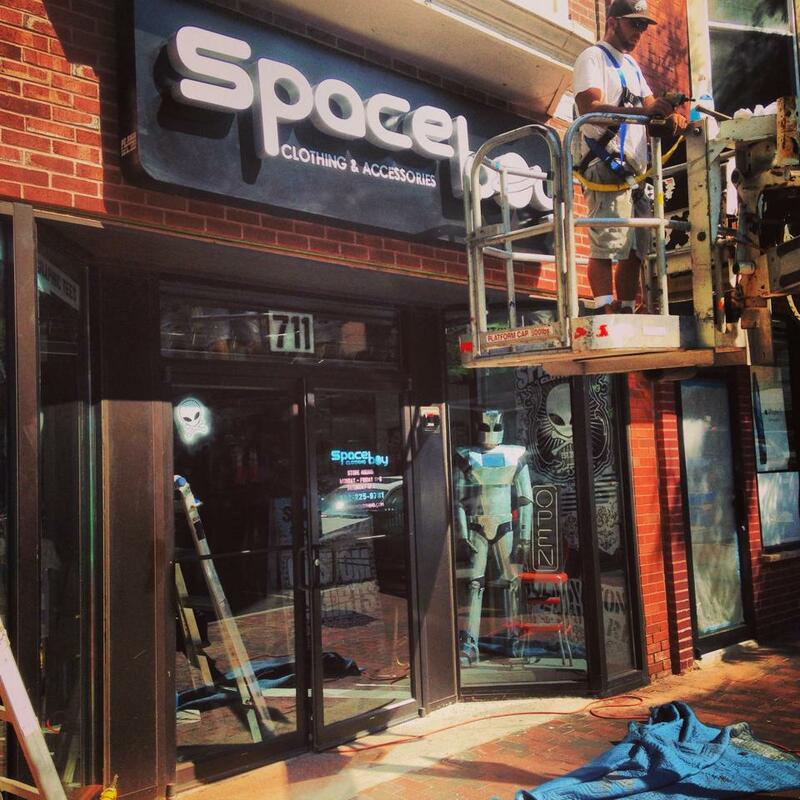 SPACEBOY CLOTHING JUST HIT THE 8 YEAR MARK! It's amazing how fast time has gone and how much we've learned and grown over the years. We want to thank everyone for your support, please keep spreading the word and we'll continue to do what we do. We're not throwing a big birthday party or anything this year but definitely check out one of our monthly comedy shows and keep an eye out for some cool new stuff coming soon! Check out this photo timeline from when we first started! WE'VE BEEN DOING SOME PRETTY COOL STUFF LATELY! CHECK OUT THIS JOB WE DID FOR AMY SCHUMER LAST MONTH! PICK ONE OF THESE BAD BOYS UP AT THE LAST SHOW OF HER TOUR AT MADISON SQUARE GARDEN JUNE 13TH. 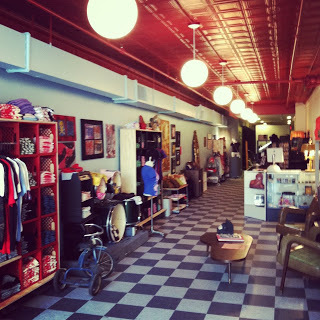 GET YOUR SKATE GEAR AT SPACEBOY! CHECK OUT THE PROMO VIDEO FOR THE FRIDAY NIGHT COMEDY SERIES COMING APRIL 8TH HOSTED BY THE ONE AND ONLY DAVID HALLBERG! ADVANCE TICKETS ARE AVAILABLE OR GRAB THEM AT THE DOOR. SEATING IS LIMITED! Ladies and Gentleman here it is! A Friday night full of stand up comedy and improv featuring performers from Delaware, Philadelphia, Baltimore and who know where else. Our event space isn't huge so make sure you get there early to get your seat! Check out the Facebook Event Page for more info! We've got some NEW designs & MORE coming your way! It's That time of year again! Warmer weather is on it's way & we've got some cool new stuff coming! Go to our webstore and pick up one of these nifty hand printed T-Shirts! HOLY JEEZ! SPACEBOY IS 7 YEARS OLD! I know we don't have huge parties every year to celebrate our existence but I just wanted to acknowledge to you all that we are now 7 Years old. The past few years have been awesome and super crazy. Thanks everyone for your love and support. Here is a photo timeline from when we first started in 2009! Enjoy! Noah and I have known each other since we were 14 after meeting in church camp. We were both kinda weird so we kept in touch over the years, became room mates and have always talked about opening a cool shop some day. In late 2008, this spot opened up on kirkwood highway. It was all redone inside and the owner was a pretty cool guy so we made a deal. Here is a mock up I did in photoshop to see what the store might possibly look like. Parking was kind of weird so I drew this map to help people figure it out. 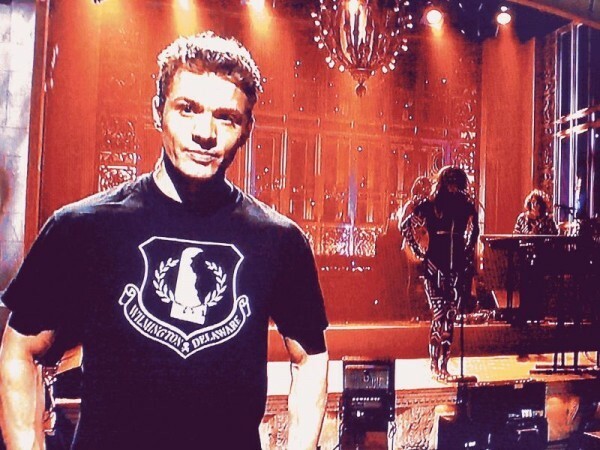 In the Spring, Ryan Phillippe wore one of our shirts on SNL and that jump started us like crazy. Then David Hallberg aka Pony came aboard to party with us in the Printshop! We rocked on Kirkwood Highway for about 3 years ran out our lease and decided it was time to move on. 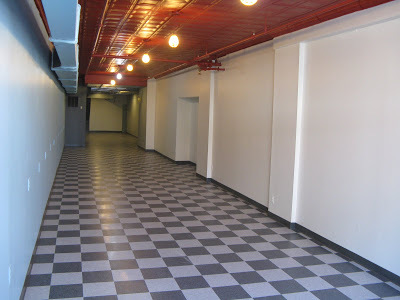 In late 2011 While we were still at Kirkwood, The Buccini Pollin Group approuched us and offered us a space at 617 North Market Street. We had a couple meetings, they showed us the space and at first we said "Hell No." 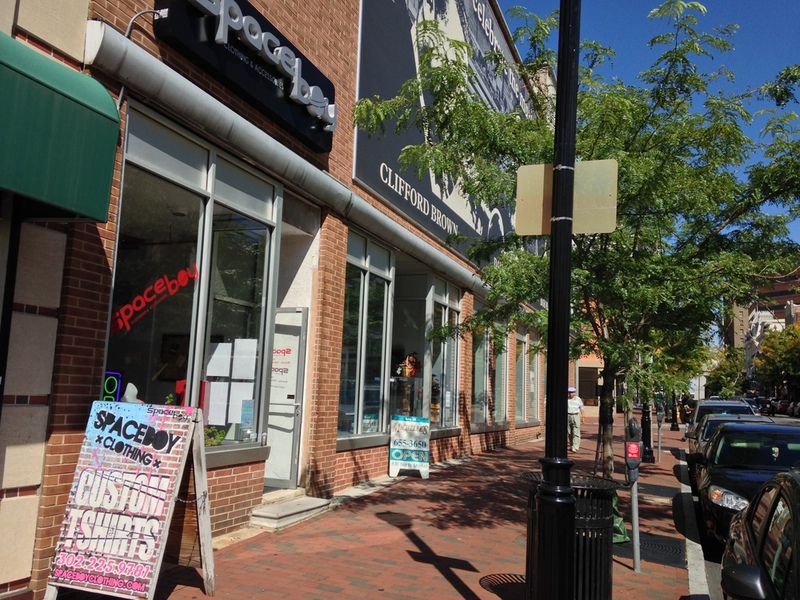 But after a while we noticed the potential that Downtown Wilmington had and wanted to be part of that. BPG hooked the place up! Gave the place a make over and told us to hurry up and move in. Will Minster from Downtown Visions helped us get a grant for our sign. Here's another mock up I did of the front. The move was not fun what so ever but we managed to get it done and the sign was delivered eventually. The store was now pretty much complete and that was when we began our adventures on Market Street. The extra space in the back allowed us to hold events, art shows and parties. Lots a great bands came through, local and touring and Spaceboy was buzzing. 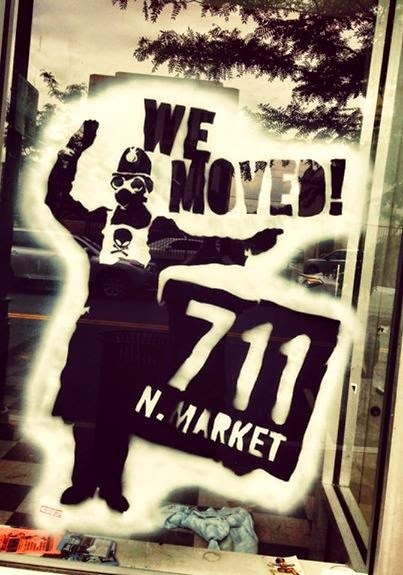 Then in mid 2014 we moved into 711 North Market so BPG they could renovate our building. So we moved our crap...again. and the guys moved the sign... again. 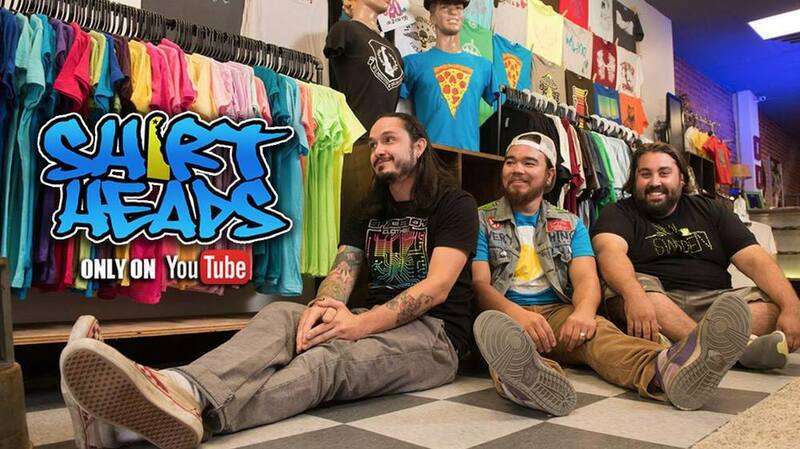 Check out our web series SHIRT HEADS to see footage of us putting our 3rd store together and daily life on market street. 7 Years later, we're still here! Making friends, some money and tons of really sweet memories. We even set up a cool underground event space in our basement. Life Downtown isn't too shabby and the city is getting better everyday. Need custom printing? Send us an e-mail! For currents events, updates, new merch and more check back here or any of our social media outlets. Thanks so much for stopping by. Please be sure to link up with us via Twitter, Facebook, & Instagram, Link below. Feel free to contact us with any questions or suggestions. On another note..... ever wonder what happens when you screen print with nacho cheese dip? Well we did it! Check out the video to see if it worked or not.